This post begins a series on how infection, and specifically hospital-associated infections, affect special patient populations. Our first series will be dedicated to those patients facing a cancer diagnosis. As with any serious disease, the many types of cancer put a great deal of stress on the body and can make a person more susceptible to infection. Unique to cancer, however, are the infection risks due to the disease's treatment. 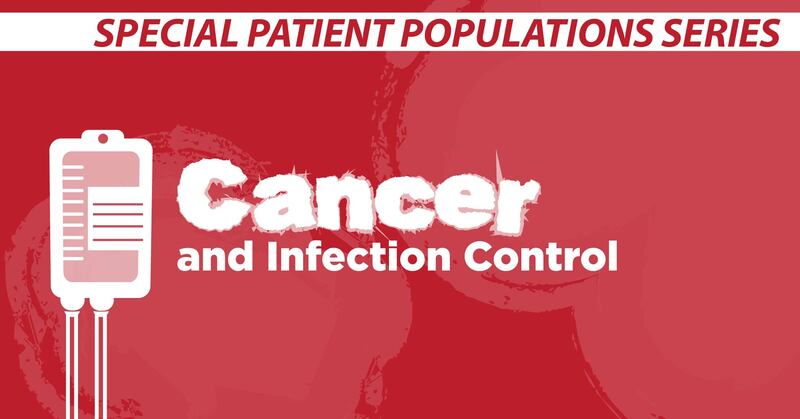 Today we will explore how cancer and infection intersect in this special population. Our bodies are magnificent biological machines working 24/7 at the very important job of living. This incredible machine is made up of specialized organs: some that take in and distribute nutrients, others that take in oxygen and use it to oxidize those nutrients into usable parts, and still others to filter out toxins, fight infections, and get rid of waste. When we are healthy, all these parts work together to keep us alive. In turn, all our organs are made up of specialized cells, each the result of specific genes in our DNA instructing specific proteins to form our lungs, stomach, kidney, brain - every one of our biological structures. Even within one organ, there are often many different types of cells all working in concert, each doing their job. They reproduce - or stop reproducing - when they are told to do so by chemical signals either inside or outside of the cell. When cells are faulty and not able to perform their job, our bodies send a signal to shut them down and stop further damage. Sometimes, however, cells are missing the receptor for this signal, and continue to reproduce, creating more faulty cells. Sometimes the altered cell is missing the internal signal telling it to stop reproducing. The result are areas of cells that won't stop reproducing: Cancer. How does cancer and cancer treatment make someone more vulnerable to infection? Our body's natural defense against infection is our immune system. The soldiers of the immune system are white blood cells, cells that can destroy bacteria, viruses, and other foreign substances. White blood cells are made by the thymus and bone marrow and are activated when a pathogen or foreign substance is detected. They are present in our tonsils as a first line of defense to consumed or inhaled pathogens, and produced in our bone marrow as a component of our blood, and in our lymph fluid that carries nutrients from our blood to our organ tissues. At many points along the way, including lymph nodes and our spleen, pathogens are filtered out and destroyed by white blood cells. When cancer affects any of these systems - the thymus, the lymph nodes, the bone marrow, etc. - the body's natural defenses against infection are drastically weakened and the patient is considered "profoundly immunocompromized." This weakness can make even a simple infection very dangerous to a person with cancer. Cancer in other parts of the body can also lead to a higher risk of infection. For example, a tumor that is preventing drainage from the lungs or reduces blood flow to another organ can make those areas more prone to infection since the white blood cells cannot reach pathogens as quickly or effectively. Cancer that results in skin lesions can make a patient more vulnerable to pathogens entering the body as well. While every cancer is different, and there are over 200 types as well as the variety of cancer cells themselves, this kind of cell damage makes a patient more vulnerable to infection. Cancer treatment itself can make a patient have a weak immune system, although often only temporarily. Chemotherapy, in which chemical combinations are used to kill off fast-growing cancer cells, can also kill healthy fast-growing cells, including bone marrow cells (hair cells are also fast-growing, which is why some patients lose their hair during chemotherapy treatment). Radiation therapy that includes parts of the body that produce white blood cells can also affect the patient's immune system response, especially high-dose treatment. Radiation therapy can also damage the body's mucuous membranes, making it easier for pathogens to enter the body. Surgical procedures to biopsy tissues, implant devices, or remove cancerous tissue have the risk of infection as well, since any breach of the skin has the potential to let in pathogens. Patients receiving donor stem cells, bone marrow, or other tissues are also at a higher risk for infection due not only to the procedures, but also the body's response to the donor tissue. Even though these treatments can elevate the risk of infection, they are still life-saving and necessary actions - and any infection can delay this treatment. Patients who develop any infection may have to delay radiation or chemotherapy treatment due to low white blood cell count, meaning the cancer cells have more time to continue to grow. Surgical site infections can set back treatment and weaken the patient for further follow-up treatment (since many patients need both surgery and/or chemotherapy and/or radiation therapy). As a result, every possible measure to prevent transmission of dangerous pathogens to the cancer patient must be taken. What about hospital-associated infections and the cancer patient? Evidence shows that hospitals can take steps to reduce HAIs, including those in cancer patients. Environmental cleaning is critical, and use of novel technologies that reduce the pathogens in the environment, both short-term and continuously. Tracking and analyzing pathogens is also important, including genomic sequencing to get a better picture of how the pathogens are moving around the hospital. Visitors and caregivers at home must wash their hands regularly, stay away if they are sick, and get have up-to-date vaccinations including yearly flu shots. The patient him or herself must bathe daily, wash hands regularly, wipe down touch points in public areas (ATM buttons, computer keyboards, etc. ), avoid high-contamination activities or areas (hot tubs, manicures, standing water), and monitor themselves for signs of infection. The important thing to remember is that each and every infection weakens the patient, making him or her less able to tolerate treatment and recovery. Is there more that can be done? Could everyone helping the patient do more to help avoid life-threatening infections? Our next post will address this with a very personal, heart-wrenching story (with a happy ending! ), so please stay tuned to learn more.